Our range of products include single phase lightning arresters. Single Phase Lightning Arresters are caused by remote lightning discharges or switching operations in large electrical systems. During thunderstorms, too, high volumes of energy are instantaneously released. Lightning strikes also pose a serious threat to sensitive electronic equipment. These voltage peaks can penetrate a building through all manner of conductive connections and cause enormous damage. 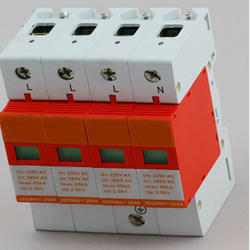 Surge arresters are available for single phase & three phase systems with class C / class B + C protection. Looking for Single Phase Lightning Arresters ?